Canon has dedicated a website to the upcoming Solar Eclipse Photography. Below is an excerpt from CDLC on how to use Solar filters safely. So far in our eclipse series we’ve discussed camera bodies and lenses that can be used to photograph the upcoming total solar eclipse. This article covers solar filters, the most important consideration for solar photography and direct viewing of the solar eclipse. IT IS NEVER SAFE TO LOOK AT THE SUN WITHOUT PROPER EYE PROTECTION WHEN ANY PART OF IT IS VISIBLE BEHIND THE MOON! 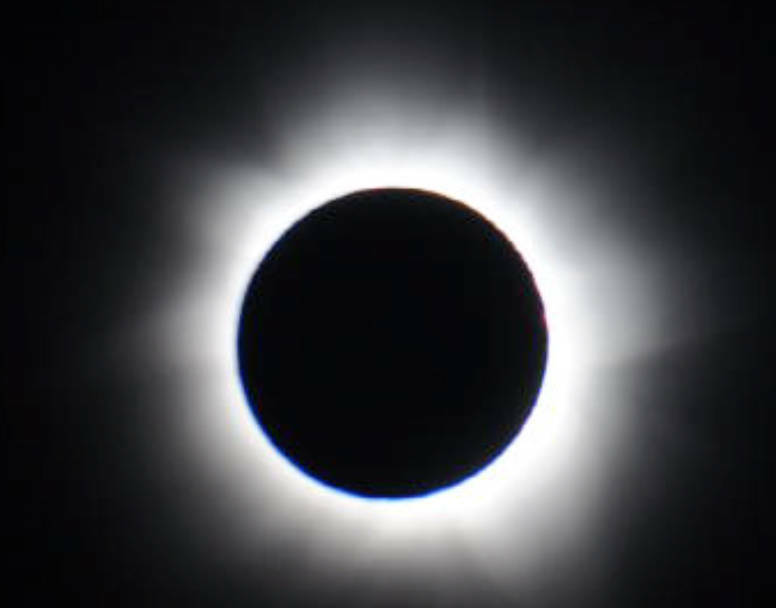 THIS ALSO INCLUDES NOT LOOKING THROUGH YOUR CAMERA’S VIEWFINDER WHEN PHOTOGRAPHING THE ECLIPSE – USE A SOLAR FILTER ON THE FRONT OF THE LENS, AND LOOK THROUGH YOUR LCD SCREEN INSTEAD OF THE VIEWFINDER! Now that we’ve made our camera and lens decisions, we’re going to be actively involved with looking at and photographing the eclipse. We need to pay close attention to the use of the solar filter. We can’t stress the importance of safety for your eyes and your camera gear enough. Beware of solar filters being marketed on the Internet as “safe.” Our emails are full of questions from readers asking about these filters. Just because they claim to be safe doesn’t mean they are. A truly safe filter for viewing and photography should have a CE or ISO certification. There is a difference between solar filters used by the public for viewing the solar eclipse and photographers photographing the solar eclipse. Some marketers are saying that ND filters that restrict 14 – 16.5 stops of light are ‘safe.’ These may be safe for photography use only but definitely not for direct viewing. Restricting the light being passed through a filter is only part of the story. A safe filter for photography and viewing also restricts infrared and ultraviolet light beyond 800nm. Neutral density filters don’t do this. In some cases, you may feel the warmth in your eye but in most you won’t. At that point the damage is done to your eye. All partial phases of the eclipse absolutely need a solar filter. About five seconds before totality, there are still a few tiny rays of sunlight peeking between the valleys of the craters on the moon. This creates what has been named “Baily’s beads,” after English astronomer Francis Baily. As soon as the “beads” disappear, you can remove the solar filter for about 2-1/2 minutes (varies depending on your location in the path of totality) until Baily’s beads reappear again. When they reappear, that’s the end of totality. Then, immediately replace the solar filter on the front of your lens. Do not remove it again until you’re finished photographing the sun. Always use your LCD screen to position the sun. Don’t use your camera’s viewfinder. Never look at the sun without accredited and approved solar filtration over your eyes. There are special solar viewing frames that can be used over your eyeglasses or solar viewing glasses for those that don’t wear glasses. Permanent, irreversible eye damage and/or blindness can result in seconds and you won’t even know it. Never point your camera into the sun without a special solar filter. All camera lenses need an accredited and approved solar filter mounted on the front of the lens. Not using a solar filter at eclipse magnifications can ruin your camera in seconds! Intense light passing through your lens at eclipse magnifications, without a solar filter, can fry your image stabilization and aperture mechanisms, damage your sensor and shutter, and cause permanent eye damage. Eclipse magnification is a lot different than what landscape photographers do when they have the sun peeking through a tree canopy with their wide angle lens stopped down to f/22 to create a starburst effect. In that case the sun is so tiny and the exposure is so brief, there isn’t any damage. Never improvise, modify or use general photography neutral density (ND) filters regardless of density even up to 16 stops. They are totally insufficient to provide the protection your eyes, and your equipment, need. Neutral density filters, regardless of density, transmit high levels of invisible infrared and ultraviolet radiation which can cause a thermal retinal burn. You won’t feel anything, but the damage is done. Stacked neutral density filters don’t do anything more than reduce the intensity of the visible spectrum either. And, as photographers, we know that shooting through multiple filters dramatically reduces sharpness too. Buy an approved solar filter. They’re relatively inexpensive and are designed for the task. Don’t risk your eyes or your sensor! Solar filters can transmit or restrict different wavelengths of light such as “white” light and Hydrogen-Alpha light. The most common solar filters used by amateur photographers transmit “white” light – which refers to the visible spectrum and not necessarily the color of the sun disk it produces. Scientists and advanced photographers may want to see details such as prominences and solar flares on the surface. In this case, you’ll need a special filter known as a hydrogen-alpha (or H-alpha) filter. This type of solar filter can be expensive and is available from professional solar filter companies such as Astronimik, Baader, or Thousand Oaks. For most of the rest of us, there are many “white” light solar filters on the market. There are round non-silvered glass filters, round silvered glass filters, thin metalized Mylar sheets and special silver/black polymer solar film filters. There are filters meant for photography and filters meant for observing. The first decision you need to make is whether or not you want a “photographic only” solar filter to protect your camera’s sensor, or a filter safe for visual observing (or while looking through your eyepiece if your camera doesn’t have Live View on your LCD screen) to protect your eyes. The next consideration you need to make is the color of the sun that the filter will produce. Non-silvered glass and metalized Mylar produce a blueish-white sun disk while professional silver/black polymer solar film produces a yellow sun disk. Most glass filters are not silvered on the front and are good for photography only, but read the instructions that come packaged with your filter. The Hoya Pro ND100000 (5.0) filter is the most commonly available filter and produces a blueish-white solar disk. 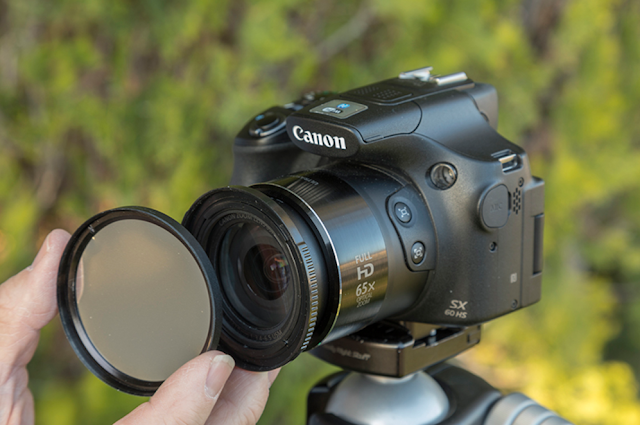 Most camera retailers have this filter available in traditional threaded filter sizes up to 82mm. The Canon EF 100-400mm zoom, the EF 300mm f/4, and the EF 400 f/5.6 telephotos use a 77mm filter thread. The popular Canon EF 70-300mm f/4-5.6L zoom uses a 67mm filter thread. The Hoya Pro ND100000 (5.0), or similar filters, are designed for photography only and will do the job, but isn’t recommended for visual viewing such as looking through your camera’s eyepiece or holding it up to your eye for solar viewing. Read the instructions. Use your LCD screen only to safely view the eclipse if you’re using this type filter. As photographers, we’re used to using glass filters such as polarizers and neutral density filters that thread into the front of our lenses. Since the beginning of digital photography, many advanced photographers have become used to using large square or rectangular resin (plastic looking) filters that are of very high optical quality. They are used in special holders mounted onto the front of the lens. With large front-mounted filters in mind, there are different types of solar filtration available for large diameter Canon L-series, big white telephoto lenses. In this case, you’ll use large filters that mount over the front of the lens – often referred to as full aperture filters. There are two ways to mount these filters. You can buy them in sheets and fashion your own frame large enough to cover the front of your lens or buy the filter already mounted into a round aluminum housing that slips over the front of the lens. Just as in the mounting, there are two types of solar material used in these type filters: Metalized Mylar foil and Silver/black polymer film. Thin, metalized Mylar is an inexpensive foil type filter that will do the job and is available all over the Internet. Be careful as to the source some of these Internet resources use. It is difficult sometimes to determine the actual manufacturer of this material because, in some cases, this material is also used in the food packaging industry and is repurposed as a solar filter. This Mylar material is prone to pinholes. This is usually sold in sheets that can be cut to fit various homemade mounting devices. Being silvered on both sides, this material is highly reflective and has the possibility of creating reflections off the front of your glass, onto the back of the silvered Mylar filter and then back into your lens. Check the photo below (sent in by a reader) that shows this ghost-like halo. This type filter produces a blueish/white sun disk. Silver/black polymer film has the optical quality of glass and is flat compared to the wrinkle prone metalized Mylar foil material. The advantage of this type filter is that the silvered front surface restricts the transmission of the infrared and ultraviolet spectrum making it safe for direct viewing or photography. And, the black reverse side of the filter eliminates the “ghosting” reflection off the back of the filter. This type of filter produces a yellow-orange colored sun disk and is relatively inexpensive. These filters are completely safe for viewing as well as photography. They block the harmful Infrared and ultraviolet wavelengths. A popular source for large-lens slip-on filters, solar viewing glasses and solar viewing frames is Thousand Oaks Optical. Their filters are used by scientists, astronomers and most observatories all over the world. They’re also approved by NASA and CE and ISO certified. Check their website for the filter size for your telephoto or super telephoto lens. Most of the large Canon L-series lenses have a rear mounted slip-in filter tray. NEVER use a solar filter in this tray. 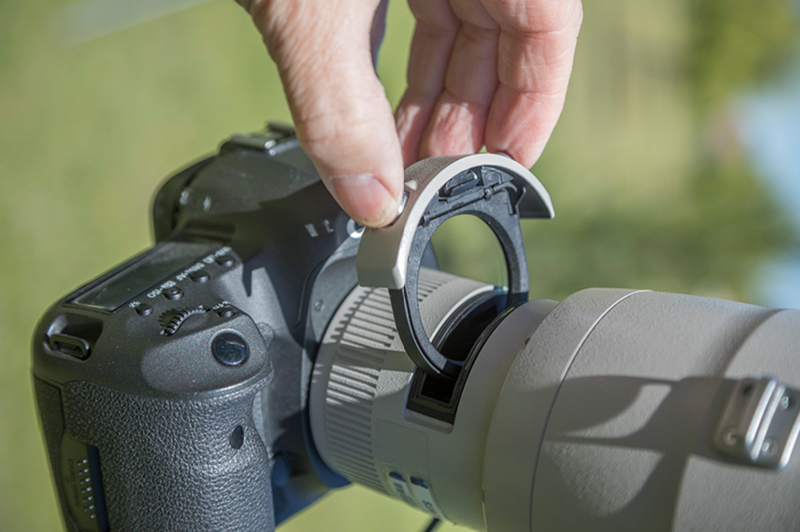 This filter mounting system is designed for terrestrial photography using traditional photography filters. It is not designed to house a filter to be directed celestially into the sun. At these magnifications, you will destroy the filter -- similar to taking a magnifying glass to a leaf and put your lens, sensor and your eyes in danger. The intense light and heat could fry aperture and image stabilization mechanisms, damage the autofocus sensor and, if the mirror is locked up ruin your sensor. Buy the correct front-mounted solar filter. They’re relatively inexpensive and completely safe. If you’re part of a solar viewing group, or just want to enjoy viewing the solar eclipse without a camera, there are safe options as well. You can use special-purpose solar filters, such as “eclipse glasses” or hand-held, cardboard mounted solar viewers. For this kind of viewing, there are many sources for cardboard mounted solar filters such as Eclipse2017.org, Greatamericaneclipse.com and ThousandOaksOptical.com (Thousand Oaks also has a large rectangular “viewer” for people that wear eyeglasses; you simply hold it in front of your eyeglasses). IT IS OK TO WATCH, ENJOY, AND PHOTOGRAPH A SOLAR ECLIPSE - BUT ONLY IF YOU DO IT SAFELY AND WITH PROPER EYE AND CAMERA PROTECTION! If you have questions you'd like Dave and Ken to address in an upcoming article, email them at : info@theeclipseguys.com.